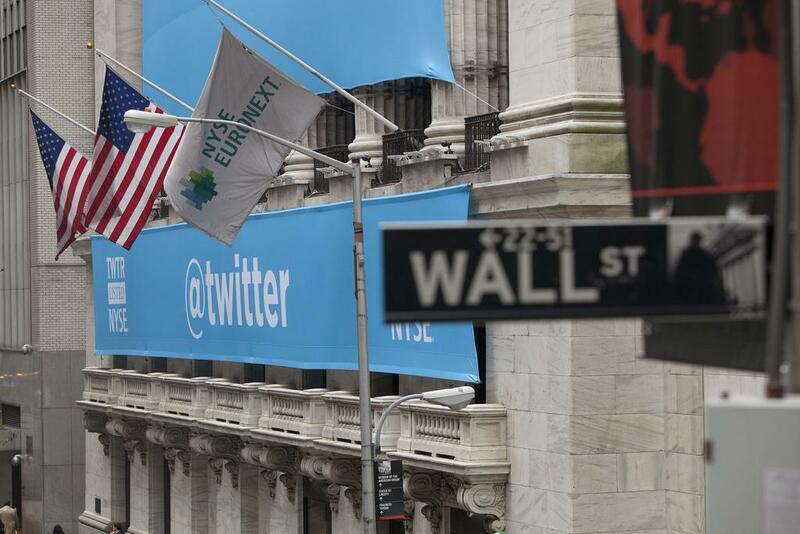 How Much Equity Do Founders Have When Their Company IPOs? This post is adapted from the blog of Craft, a Priceonomics Content Platform customer. Does your company need tools to make better content? Become a Priceonomics customer. The vast majority of startups fail and generate zero wealth for any of the founders. But what about rare company that IPOs? If you're the rare founder that makes it across the finish line, what's the payoff and how much of the company do you still own? 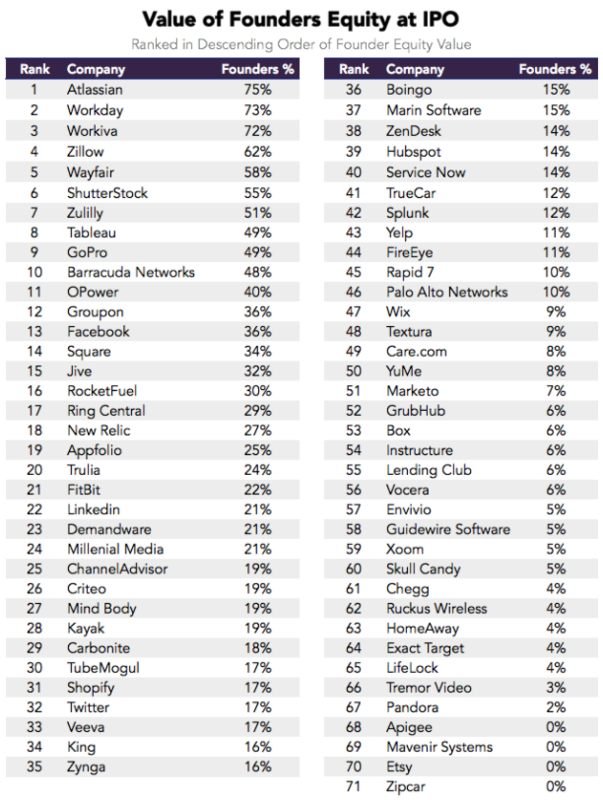 Early-stage venture fund Founder Collective recently analyzed 71 tech sector IPOs, to see if there was any connection between the amount of venture capital a company raised, and its performance after IPO. 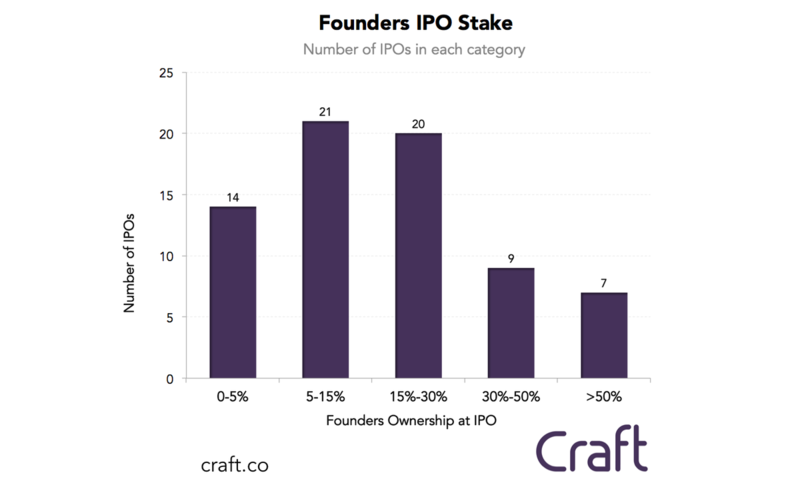 We were interested to understand another aspect of the IPOs - how much equity did the founders own at the IPO, and was there any correlation between their shareholding and the amount of funding they raised? Our hypothesis was that we would see an inverse correlation, in which the more capital a company raised, the less equity the founders would hold at IPO. On Craft, we have in-depth profiles of each of the 71 public tech companies, so we searched our database for the names of the founders, and the amount of equity they held at the IPO. On average, all founders combined owned 15% of the company, which was worth $100 million. Surprisingly, bigger VC fund raising had no statistical correlation to founder percentage of ownership. 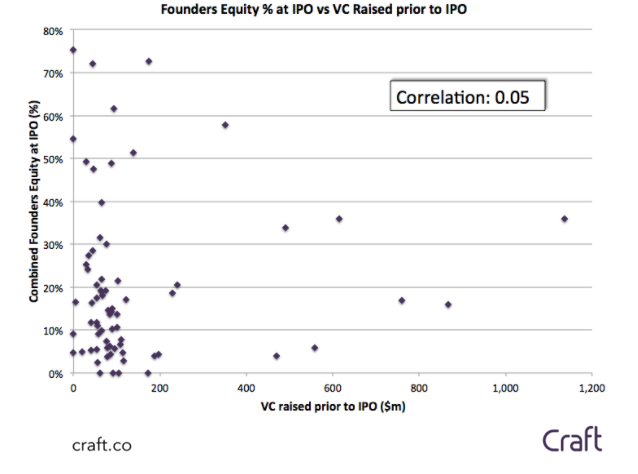 There was, however, a positive correlation between VC funds raised and value of the founder's stake at IPO. The number of founders at each company ranged from 1 to 6, with a median of 2. In 4 of the IPOs (Apigee, Mavenir Systems, Etsy, and Zipcar) the founders held no equity, meaning they had sold all their shares by the time the IPO took place (and in most cases were no longer with the company). This chart shows different categories of % ownership, and how many IPOs fell into each. The highest founders shareholding was with Atlassian, where the 2 founders held a combined 75% at IPO. This makes sense, considering the company is somewhat famous for having raised zero venture capital. The median shareholding was 15% across 2 founders. And the lowest founders shareholding was with Pandora where the 3 founders held 2%. The value of these stakes varied massively, based on the market value of the companies at IPO. 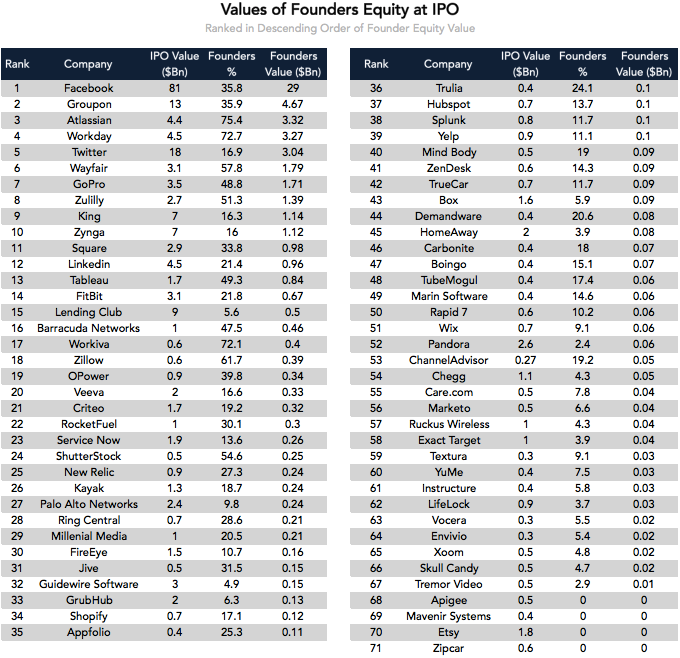 This tables also shows the IPO valuation and the value of the stake held by the founders. 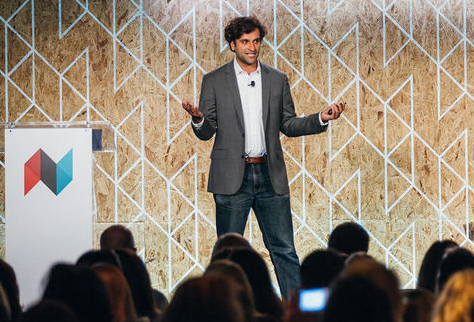 The Founders ownership value (excluding where founders owned no equity at the IPO) ranged from $14 million across three founders for Tremor Video up to more than $29 Billion for the founders of Facebook. But did more VC fundraising on the way to IPO mean a bigger outcome and bigger payday for the Founders? In terms of actual correlation between amount of funding raised, and % shareholding of the founders, we found there was none: 0.05. 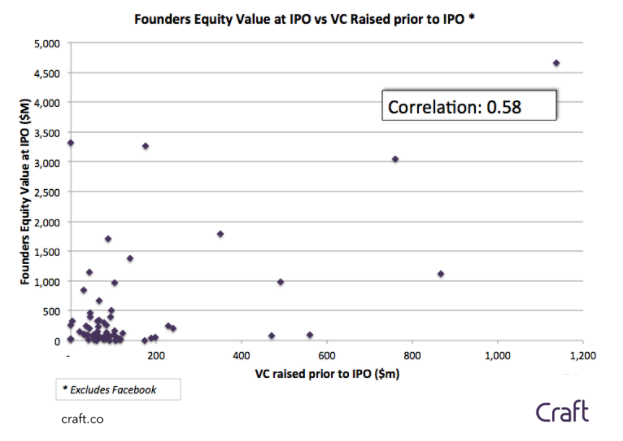 However factoring in the different size of the IPOs to arrive at the actual dollar value of the Founders’ stake, there was a positive correlation of 0.40 with VC funding raised, and 0.58, if we exclude the outlier Facebook. Every startup’s financial journey towards IPO is unique. On average tech Company Founders owned 15% (between all of them!) at IPO, and some owned none. And while there was no correlation between the size of the Founders equity stake and VC raised, there was a positive correlation between the dollar value of the Founders stake at IPO and the amount of venture capital they raised. This post is adapted from the blog of Craft, a Priceonomics Content Platform customer. 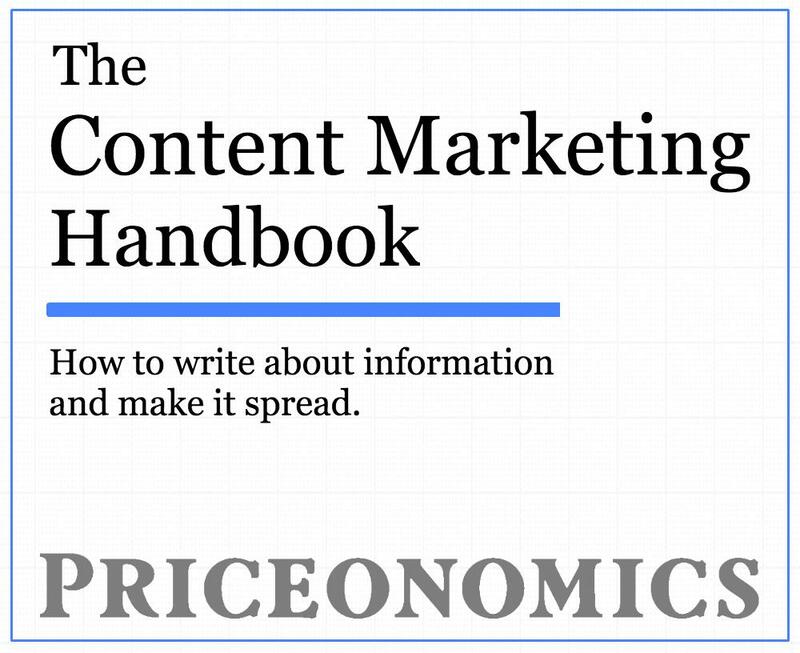 Does your company need tools to make better content? Become a Priceonomics customer. Cover image by Anthony Quintano.